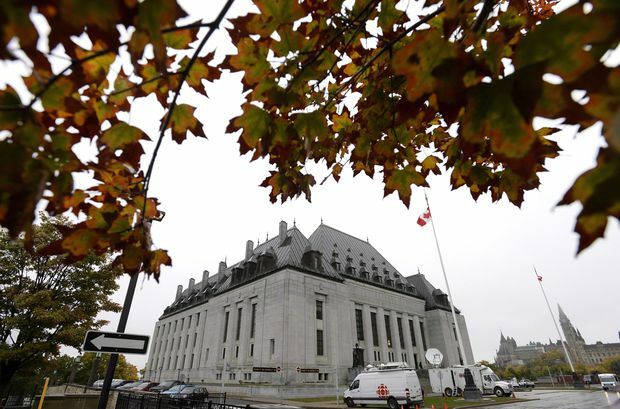 The Supreme Court of Canada is seen in Ottawa on Oct. 11, 2018. The Supreme Court of Canada’s recent ruling that barring some expatriates from voting in federal elections is unconstitutional is not likely to cause a surge of new voters – but it will “solidify” Canada’s reputation as a democracy that allows more of its citizens to participate, a former chief electoral officer says. “Canada is the one with the broadest definition of an electorate and that is Canada’s brand as an outstanding democracy, as a leading democracy,” said Jean-Pierre Kingsley, who served as chief electoral officer from 1990 to 2007. Previously, citizens who lived outside of the country for more than five years were prohibited from voting in federal elections. Two Canadians working in the United States, Gillian Frank and Jamie Duong, challenged those restrictions after they were unable to vote in the 2011 federal election. The Liberal government repealed that voting restriction with a law passed in December, Bill C-76. But the Supreme Court ruling now dictates the way forward to any future government that would consider changing the law, and it takes immediate effect. Elections Canada recently advertised the change in advance of three by-elections, saying that a Canadian living abroad who previously lived in one of the three ridings is eligible to vote. But he predicts the effect of the law will be minimal because in the past, few people living abroad registered to vote. According to Elections Canada, 9,160 voters are on the International Register of Electors. The total ballots cast in the last federal election by international electors was 11,001, and 6,332 international electors cast ballots in the 2011 federal election. Emmett Macfarlane, an associate professor of political science at the University of Waterloo, agreed with Mr. Kingsley that the court arrived at the right decision. “The law obviously affected at least some people who still have a meaningful attachment to Canada, and for that reason the five-year limit was far too restrictive,” he said. Prof. Macfarlane said the number of people who were affected by this law and who will go through the process to vote will be too small to give any political parties an advantage. “Even if thousands more expats now vote, their votes will be spread across all ridings and so will have a relatively small impact,” he said. Stephanie Kusie, the Conservative critic for democratic institutions, said her party is “disappointed” with the court’s ruling. Ms. Kusie said she can’t find any pieces of recently passed legislation that would affect non-residents. Conservative Senator Linda Frum called the ruling “dangerous and extreme” because it throws the door open to non-resident Canadians.